Believe in second chances this Christmas. Ellie Marsden couldn't wait to shake the dust of Branding Iron, Texas, off her heels and chase after bright lights, big city, and a wealthy husband. Now she's come home, divorced, a little disillusioned, and a whole lot pregnant. Leave it to her one-time high school sweetheart, cattle rancher Jubal McFarland, to point out that citified Ellie is as out of place in small-town Texas as her teacup poodle. So why is there something about being back-and being with Jubal-that feels surprisingly right? Jubal's eight-year-old daughter, Gracie, needs a mother, but he hasn't found the perfect woman. Or maybe the problem is that he did find her, and had his heart broken when she left town. Gracie's already falling hard for Ellie and that ball of fluff she calls a dog. And no matter how hard the rugged cowboy tries to resist, there's no denying the appeal of first love and sweet new beginnings-especially when there's a little Christmas magic in the air. 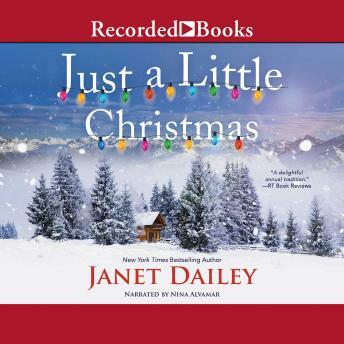 Author bio: Janet Dailey's first book was published in 1976. Since then she has written more than 100 novels and become one of the top-selling female authors in the world, with 300 million copies of her books sold in nineteen languages in ninety-eight countries. She is known for her strong, decisive characters, her extraordinary ability to recreate a time and a place, and her unerring courage to confront important, controversial issues in her stories. You can learn more about Janet Dailey and her books at JanetDailey.com.